Error message not showing for template-driven form validation? Should I validate input in API or BL layer? Ways to integrate the Jira issue collector with an Angular app? How to use actual component method in google pie charts eventlistner? What I'm encountering is that when I use *ngIf for the element profile, the error message doesn't become visible, but when I don't use *ngIf, the validation error shows. What could be the reason behind this? 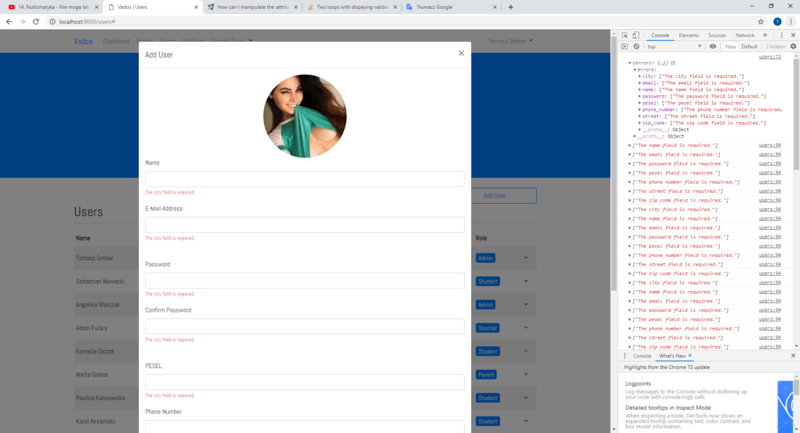 Form not sending I have multiple forms on different pages of the site they are all programmed the same. I have 2 though that will not work when every other form works fine. I am attaching code for the short on and seeing any has any idea why the other forms would work but these would not even though programmed identically other then the inputs it is pulling as they are for different forms. control w-100" name="textarea" id="textarea" cols="30" rows="6"
$body .=    '<table rules="all" style="border-color: #666;"
$body .=    "<tr><td><strong> Name: </strong></td><td>"  .$name . $body .=    "<tr><td><strong> Message: </strong></td><td>"
I'm trying to get a form with the field Exchange already populated as "HELLO". Using value in HTML is not working and the field is showing up blank. I tried adding autocomplete=off, but that did not work either. i have a doubt, i want to save a form and without use a submit button. i need to increase "cantidad" but i don't want to use a "sumbmit" button, otherwise, i need that the data (integers) will stay correctly in a database field. 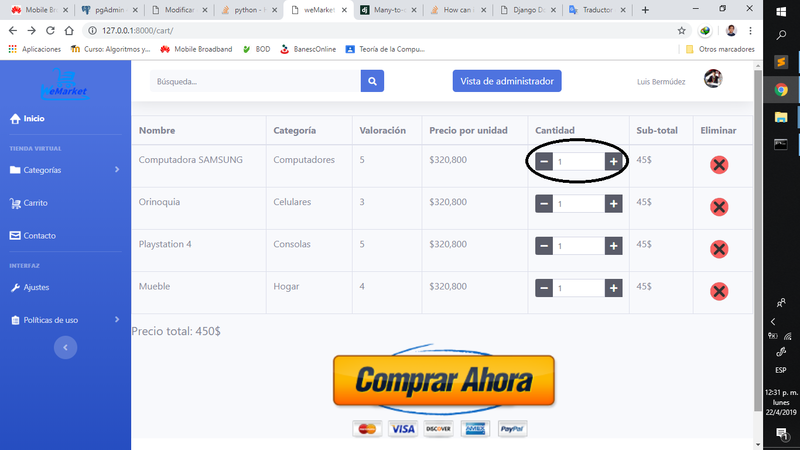 I want to modify the field 'cantidad' when the user increase or decrease Selection, as you see in the image and without a submit button. I am learning right now AJAX requests with Laravel and I have a big problem. I am returning a list of errors (JSON), but I can't "display" it properly. As you can see i am trying to do it with two $.each loops. But it is not working just like should to. Can anyone help me, cause I'm stacked :( Have a nice day! I have a node.js application with an API, BL and DAL layers and I want to validate user input. This should be pretty straightforward as I think it should be a very common problem and I am probably not the the first ASP.NET MVC developer to face it. I am using ASP.NET MVC Client/Server validation using data annotations and jquery.validate. Even though there is no explicit annotation on the property in the view model, jquery.validate forces it to be required (since it is a not nullable type) and also to be a valid date. it considers it an invalid date and complains (i.e., "Date("25/12/2018") is not valid"), so it does not allow to send the form. on my property, but it doesn't seem to have any effect on the validation itself. I could use a string property instead of a DateTime, and create my own custom validation (client and server), but since the property IS in fact a DateTime, it seems to me that it should be some way of using the standard ASP.NET MVC validation without having to give up on using DateTime on all my view models. In fact, I don´t even need validation for my DateTime, because the user is offered a date picker, but I want to be able to use client validation for other properties and as soon as I include the jquery.validation scripts the date validation is automatically added causing this problem. The best solution would be if there is a way (it should be?) to tell jquery.validate the date format it should validate the dates in. The second best would be a way of at least disable date validations on the client side, without disabling client validation altogether nor giving up on using DateTime in my view model. The last resort would be to use strings instead of DateTime and create my own validation, but I think that's overkill. I'm looking to create an Angular 7 app that utilizes the Jira issue collector to submit issues directly to their respective projects. When I build the app the way it is now, nothing happens. When I move the code from method "submitIssue" to under "ngOnInIt" directly the issue collector dialogue comes up. Where should the code snippet be added? Any assistance would be greatly appreciated. Thank you! //Requires that jQuery is available! This is my array that populates the cards with different projects and buttons on my issue collector component. I'm trying to implement Implicit flow using Angular 6/MSAL. The client is trying to get an ID token from Azure AD. Our AD Client is configured to provide tokens only for certain users and groups. So, when an unauthorized user (still a user inside the organization) tries to login, Azure Ad directly reroutes them to the Login Page, which is not very intuitive. I would like to redirect them to a custom page, indicating that the user is not in any of the roles required by the application. But MSAL has no option for something like "failedRedirectUri". Can someone please tell me if this is even possible with MSAL, if so how do i go about configuring it? I've tried to set the "redirectUri" from localStorage, and try to modify it before the redirect happens. but that doesn't help. On login failure for implicit flow, the user should not be redirect to the "redirectUrl" page. Instead the user should be taken to an error page where the error description is displayed.